Boston's Orange Line MBTA subway connects Back Bay, Chinatown, Downtown Crossing, State Street, Haymarket, North Station and Charlestown—good for reaching Bunker Hill and the USS Constitution (Old Ironsides). Orange Line subway trains in Boston run from Forest Hills southwest of the city center to Oak Grove north of the center. The southwest-to-north route connects you to Back Bay, Chinatown, Downtown Crossing, State Street (Old State House & Faneuil Hall Marketplace), Haymarket, North Station (Commuter Rail trains & Amtrak's Downeaster to Portland ME) and Charlestown's Community College station for Bunker Hill and the USS Constitution ("Old Ironsides"). Here's a map of the Orange Line route and stations. 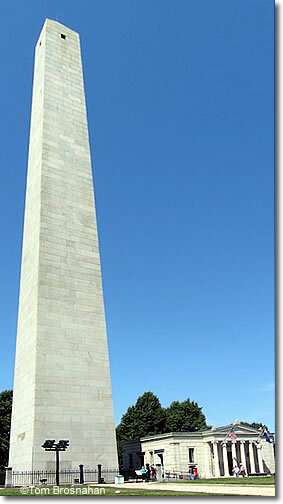 Bunker Hill Monument & exhibit lodge, Charlestown, Boston MA.